Two masterminds of last year’s bombing at the Gombe Line Transport Services in Gombe State, north-east Nigeria, have been arrested after a shootout with troops. The Defence Headquarters said the two apprehended persons, suspected to be high profile terrorists, were eventually arrested on Sunday following surveillance and intelligence operations. According to the military, the suspects were tracked to a check point at Bajoga in the state. On its Twitter handle, the military said interrogation of the suspects had started. Triple bomb explosions had occurred at the terminal of the transport company in October last year, leaving at least seven persons dead. 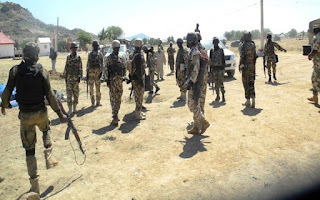 After the bombing at that time, the police said they arrested three suspects in connection with the bombing, which occurred even after the government said it had reached a ceasefire agreement with the Boko Haram terrorist group. Counter-terrorism operations are ongoing in Nigeria’s north-east region in an attempt to end the over five years insurgency perpetrated by members of the Boko Haram sect.